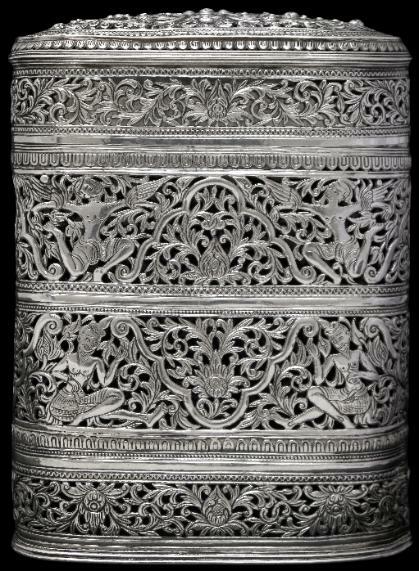 This superb cheroot container is of Shan workmanship – most probably from Ken Tung state in north-eastern Burma. 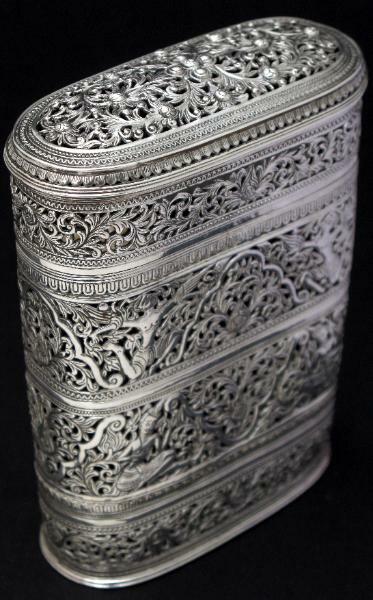 It is of finely cut and chased high-grade silver and features angel or nat-like beings amid open-work dense, scrolling fern foliage and flowers. The top of the lid is similarly impressive with more open-work and showing a series of flower buds amid foliage. The condition is excellent given the fragility of the work. However this is one small area of repair which appears to be contemporary with the piece plus one very minor loss of the tip of a fern frond. The base has a neatly engraved inscription in Burmese script.